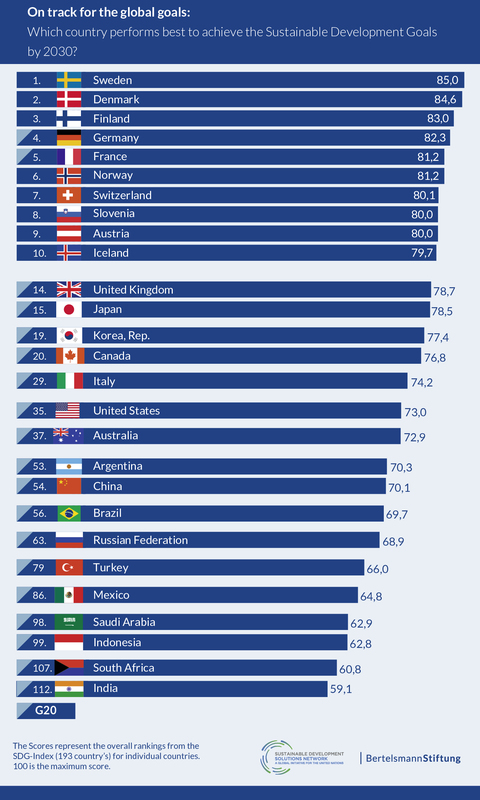 According to the SDG Index, released this week in New York, Australia is ranked 37th in the world – down from 26th last year, and behind most other wealthy countries, including New Zealand, Canada, the US and the United Kingdom. The report shows that G20 nations account for the largest negative economic, environmental and security spillover effects. Despite being among the richest nations in the world, the US, the UK and Australia are rated worst in the G20 for negative spillovers. With all countries still falling short of achieving the SDGs, the SDG Index also assesses what actions G20 governments are taking to help close this gap. Most G20 countries have begun to implement the goals, but there are large variations among G20 countries in how the SDGs are being embraced by political leaders and translated into action. Brazil, Mexico and Italy have taken the most significant steps among G20 countries to achieve the goals, illustrated, for instance, by the existence of SDG strategies, coordination units in governments, or online platforms. India and Germany have at least partially already undertaken an assessment of investment needs. Significantly, the federal government has also prepared a Voluntary National Review report on progress in implementing the goals, which it will present to the UN’s High Level Political Forum next week. The report addresses how Australia is performing against each of the goals and includes many case studies of implementation from business, civil society, academia, youth and all levels of government. It's accompanied by a new Australian SDG case study hub. Many of these activities occurred after the cut-off period for the SDG Index, so Australia’s overall performance on SDG implementation is actually higher than the SDG Index gives it credit. However, Australia isn't taking more deliberative action to address the SDGs, such as developing a national implementation plan or setting aside funding for SDG implementation. Nor are individual departments identifying the gaps in Australia’s SDG performance and identifying what they plan to do differently to address them. Given Australia’s poor performance on some of the SDGs, there's clearly a need for targeted action if we're to achieve the goals by the 2030 deadline. John Thwaites receives funding from the Lord Mayor's Charitable Foundation and the Australian Council of Superannuation Investors for a project to analyse Australia's performance on the Sustainable Development Goals. He's a co-chair of the Leadership Council of the UN Sustainable Development Solutions Network (SDSN), which produces the SDG Index with Bertelsmann Stiftung. Tahl Kestin is the network manager for the SDSN regional network for Australia, New Zealand and the Pacific. Tahl has a Bachelor of Science in zoology and applied mathematics and a PhD on Australian climate variability and extremes, and communication of climate forecasts. Prior to her current role at Monash Sustainable Development Institute's BehaviourWorks she was postdoctoral fellow at the International Research Institute for Climate and Society (IRI) at Columbia University in New York, a project scientist for the physical climate science unit of the Intergovernmental Panel on Climate Change (IPCC) in Boulder, Colorado, and a greenhouse and water reporting expert at ICLEI-Local Governments for Sustainability - Oceania in Melbourne.